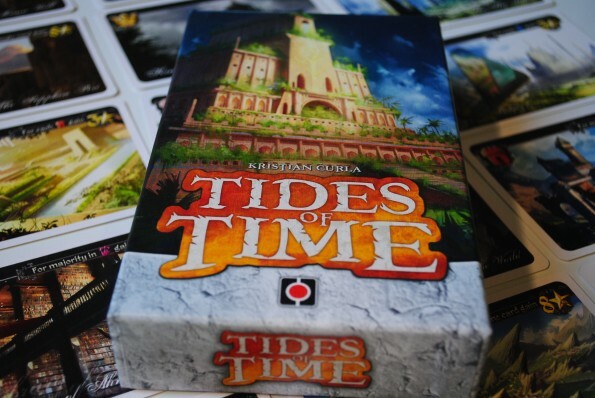 Today I’d like to introduce you to a small card drafting game called Tides of Time for two players. It’s a small 18 card game from Portal Games and designed by Kristian Curla. It’s the next step up from Love Letter and even more game than Lost Cities. What is Tides of Time like? Although there are only 18 cards and four card board markers there is quite some strategy involved. The game takes place in three rounds in which players draft cards from their hand to build their Kingdoms. At the end of each rounds a scoring takes place. (Score notepad AND pencil included!!) Players start with 5 cards in hand and choose one to play and hand over the remaining to their opponent. Players choose another card to play and draft the next from the cards handed to them until all cards are played. The 5 cards each player plays combo in interesting ways. There are 5 suits and there are three of each. Cards earn points for certain sets of suits or have triggers like; “Fore the most yellow crowns gain 7 points” or “For each yellow crown you gain 3 points.” Other cards let you win ties or give you points for each suit you don’t have. The second round is the same but first you choose a card you played last round to keep for the rest of the game, by playing a relic token on the card. This allows for strategizing into next round. Then you take all the remaining cards into hand and discard one and draw two new cards from the small deck. This means you also know a lot about your opponents hand. After a few games all 18 cards can easily be memorized. All 18 cards are used in each game. A big part of the game is hate-drafting and not allowing your opponent combo cards for points. Keeping a close eye on what your opponent is playing is a must. Not only for ruining his plans, but also to see if certain cards will return to you in the draft. For the small package it provides a lot of depth. The game has very clean and clever gameplay and provides quite some strategy and control over what you want to do. It’s easy to learn, takes 20 minutes and will keep gamers interested too. It provides quite some fun for the 15-20 minutes it takes. I feel engaged and my decisions matter, a lot. I seem to like this hate-drafting mechanic, if you don’t, this game might not be for you. Well there is almost no theme to speak about although you are developing a Kingdom according to the rulebook. The taking back your cards is seen as a prosperous civilization collapsing after a certain period of time. Okay. Good enough, moving on.. Stunning. The 18 cards are huge! (120 x 80mm) and the artwork is off the chart! Very beautiful. The cards have titles too and are called; The Roof of the World, or The Sky Pillars. The font they used for the gameplay fits the style well and is still readable. It doesn’t get better than this for a tiny card game! The big cards are sturdy but not linen finished, but the overall production is superb. They included a pencil and a zip lock baggie for the cards! They could have included a second reference card… It’s a two player game after all. This game is not complex at all, but it can be a challenge to master. Easily picked up as a filler with non-gamer friends and gamers alike. Highly recommended!